We all have catch phrases. Things we say, purposefully or accidentally, enough times that the kids have taken note. You know, these are things kids probably mimic when doing impressions of us. Which I know they do. I mean, don’t they? don’t divide by zero! if you do, the world BURSTS INTO FLAMES! Today in Algebra 2 we reviewed negative exponents and the children acted like they had never seen it before. I told them about the phrase “move it, lose it” for dealing with a negative exponent, as in, move the term to the other side of the fraction, and lose the negative sign. A student who moved here from another state (where, you know, they get to spend enough time on things to actually learn them) told us about the phrase she learned “cross the line, change the sign.” Which the kids liked better. “You know, because it actually rhymes, Miss Nowak. Unlike yours.” Um, last I checked “it” rhymes with “it.” I’m not an English teacher! You can tell because I’m not wearing cool shoes and I don’t give hugs. Okay, a big giant *grin* for the best two lines I’ve ever read on a blog (the last tines, obvi). But it got me thinking more about these techniques we use to teach kids to remember things. Yes, I think kids should know the reason why particular algebraic manipulations / formulas work. But once they show me that they “get” it I have no problem with them using phrases and shortcuts to help them remember things. Or for the quadratic formula? In your mind you’re definitely saying the formula in a very specific way each time. Think about it. Yup, I thought so. So inspired by Kate, I thought it would be a neat exercise to chronicle three of the ways I get kids to remember things or do hard things. Then I say “Believe it or not, you have another amazing mathematical instrument. You guessed it, a range meter.” I then hold up my vertical index finger (“domain meter!” I exclaim) and turn it horizontal (“range meter!” I exclaim). 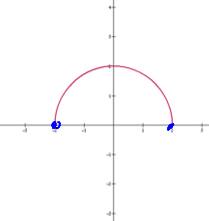 Then I take my horizontal finger and start at the bottom of the graph and move it upwards. I only start beeping at y=0 and continue until y=2. They all can state the range at this point. and they’ll get it, first try. I have my kids first rewrite the function so that they can see “inner” and “outer” functions. So for example, they have to rewrite as . That way they can see the “inner function” easily. Similarly, they need to rewrite for the same reason. I then ask them to put a box around the inner and outer functions respectively. If there are more than two (functions within functions), they should make all the boxes. Then I put a check next to the cosine function and say “we’ve dealt with you, so we’re done with you.” I then go to the middle function and say: “What’s the derivative of ?” and they all say “ . So I stick that on at the end. And fin, we’re done. It goes pretty fast once they get the hang of it. And they actually secretly love having equations that are scrawled across a whole page. Kate, forgive me for cribbing so much wholesale. But I needed to have the last sentence in there! I call it the “Shrek Method.” I begin by asking my students, “Why are ogres like onions?” They all know it’s “layers!” Then after some laughing and reminiscing and someone maybe even spouting some lines about parfaits, I remind them that ogres are also like onions because they’re smelly when you cut into them (but peeling the layers is not quite so bad). So, we do your box method, but I call them layers–and you don’t want to touch the innards of an ogre (or an onion). I’m all for the mnemonics and whatnot, but I am starting to see a few students who forget where it comes from and why it works. Some “back to basics” training may be in order for both my alg2 and calc students. Hee hee, my mistakes get them donut points. When they’ve racked up 30, I bring in the donuts. Calc classes have been known to get ’em more than once in a term. I love #2. I am so stealing your range and domain meters! Thank you, Sam! I may also steal your universe (uhh, world) bursting into flames. My students like my “I think I can…” when we’re factoring quadratics (beginning algebra, ya know). I say it while I’m putting the two sets of parens on the board. 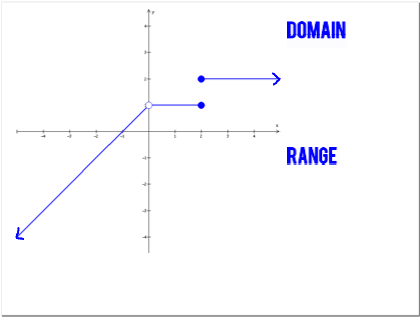 My students always struggle with domain and range…your meters just might help a bit. haha. As you can tell, I’m catching up on all my readings today. I love your domain and range meter! I’m gonna do that next time it comes up. For the chain rule, I bring in one of those Russian dolls, where there’s a doll inside a doll inside a doll inside a doll. You can work it inside-out or outside-in. Outside-in would be like yours, where you take the derivative of the outer doll, keeping it’s “innards,” then take the derivatve of the next layer, keeping it’s “innards,” etc. It’s my way of visually representing composite functions. For dividing by zero, I usually start with something innocent like “your homework will burst into flames. Then the math police will show up and fine you if the math gods don’t get here first and strike us all dead.” Something like that. For the quotient rule, I have no memory when the word low got replaced with ho and the derivative order switched around, but now I say “hi-d ho minus ho-d hi over ho-ho.” The kids love it for the “hi-d ho” (like Ned Flanders) and the really deep musical “ho-ho” which around Christmas time becomes more Santa-like. The majority of my students are international so to explain the “hi-d ho” we get to experience Great American Culture Time (as I call it in my classroom) where we watch a few clips of The Simpsons and Ned Flanders. I love the domain and range meter as well. I do something similar with a meter stick but no beeps. Let the beeping commence! Thanks for the great ideas! I’ll be using several of them! I’m teaching all remedial Algebra 1 this year in an inner-city school (did I mention it’s my first year teaching, too? Wow.). I’ve been desperate for helpful stuff and my kids love it when I use music to help them rememeber things… especially old school stuff that makes me look waaaay older than them (this is a 2nd career for me… I AM way older!). Erin, This sounds great, but I don’t know the song, and I don’t get what ‘can’t touch this’ refers to. Could you explain in more detail? This would make a great blog post, btw. I’m excited to try out your domain/range meter. My Algebra 2 students have lots of trouble with this concept. They have a lot of trouble with “seeing” the graph past the end of where the line was drawn, among other things like confusing the x- and y-axes, but maybe this is a place to start. By the way, I’ve been a fan of your blog for a few months now, and I’m currently a first year Algebra 2 teacher in Philadelphia through the Teach for America program. I only recently figured out, however, that you teach at Packer, where I graduated from in 2005! (Those SMARTboards and SFJC stuff did sound awfully familiar.) If you get a chance, do say hi to Ms. Danforth (my 7th grade math teacher!) and some of the administration (Feibelman, Genaro, etc.) who’ve been around for a while for me, and maybe I’ll get to meet you at my 5 year reunion (yikes…) next May. Ha! Awesome! What a small world this math teacher blog community is! Basically, Dr. Susan Wagner Cook divided 3rd and 4th graders into three groups and taught them how to solve equivalence problems. One group was taught a phrase to say out loud, another group was taught a gesture, and the third group was taught a phrase and a gesture. 4 weeks later, the kids got a pop quiz on equivalence problems. Only 10% of the students who learned the phrase remembered how to do the problems. But 90% of those who learned the gesture remembered how to do the problems– even though it had been a whole month! I wonder if that’s part of why “pop it out” is so effective — because of your “raise the roof” gesture. I think now that we math educators know how powerful gestures are in helping students remember things, we can come up with all kinds of awesome new ways of doing that! One more thing, about catch-phrases: I usually tell kids if they divide by zero they’ll be “breaking the laws of the universe.” I think it’s cool that so many of us seem to have independently come to similar conclusions on this one. Also, sometimes it helps them to visualize the zero as a big ball and the fraction line as a tabletop. It’s possible to balance a ball on a tabletop, so it’s possible to put zero above the fraction line. But it’s not possible to balance a tabletop on top of a ball, so you can’t put a zero below the fraction line. It’s kind of weird, but it works! Oh I like that! Thanks for passing along the link too. I just started following your blog and have really enjoyed it. For the functions meter that you used, this site might go along well. These demos are great. Thanks!